Oak is a lovely wood. Its pronounced grain is unmistakably an organic building material, and it is a feature that reminds us of all that joinery we’ve seen in historic buildings. But over time, the oxidation process adds to the wood an orange colour, which is compounded by yellowing varnish, and so an already dark kitchen starts looking even gloomier. 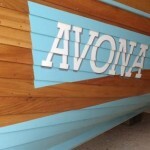 Thank goodness for paint! 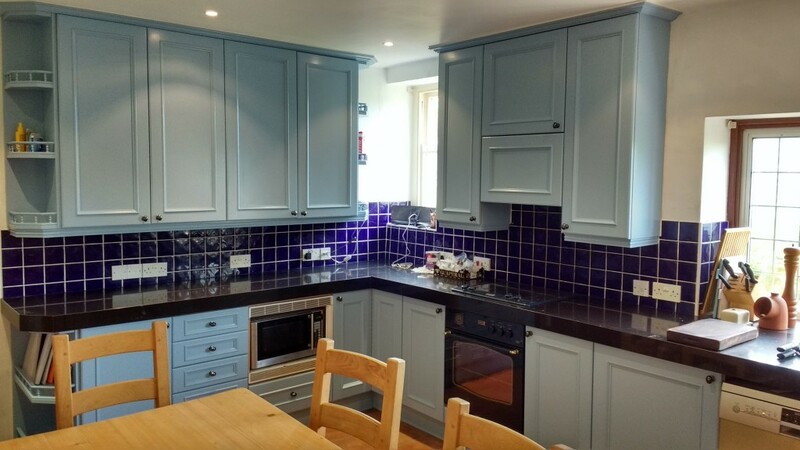 I have refinished a few kitchens around the Taunton area recently: this one was near Wellington again. The homeowners had seen my work on the internet and asked me if the owners of that kitchen would mind if they could come and take a closer look? 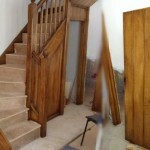 Happily, the previous customers were glad to; this was especially ideal, as their kitchen had been an oak-cover-up-job as well. I was emailed some pictures along with a sketch of the layout of the kitchen, and within 3 days I had returned an estimate of the cost to do the work. Although the pictures were a bit blurry, most kitchens come in the same sized units so, as long as I can see the extent of the work, I can sit at the computer and punch the sizes of the cabinets into the keyboard and get a pretty accurate Estimate of the cost to do the work. I usually add a little extra in case any disasters are uncovered once the work starts, but if all goes smoothly, it means that in the end it usually costs the customer less than I had originally estimated. 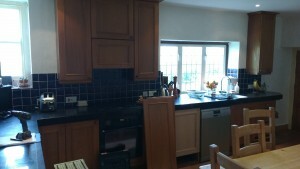 The kitchen had been constructed by a local kitchen firm, and installed in 1994. The cabinets were in a fair condition, and the doors and drawer-fronts pretty good, though showing their age with some knobs falling off as well as general grime. 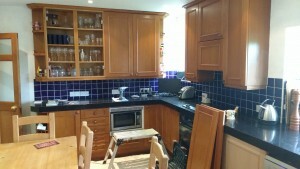 And before I arrived, a new composite worktop had been installed. It is preferable for most people that I take away as much of the kitchen as possible. This means a lot of sanding and painting is done off-site, leaving the kitchen in a usable state, albeit without doors or drawer-fronts. However, there are still at least the side panels – and if it is a frame-type kitchen then all the frames and cornice etc as well – that are not removable and so will require painting in-situ. 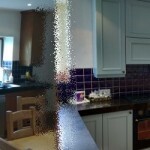 In the case of this particular kitchen, it had frame-less type doors, and removable cornice, pelmet and kick boards. And I was even able to take away the shelving on either side of the wall cabinets, which really just left the side panels to do onsite. Back at the workshop, the refinishing process consists of: a thorough de-greasing; sanding the old varnish to create a key for the primer; two coats of Otex primer; and two coats of Valtti Empire eggshell; all mixed to an equivalent of “Lulworth Blue”. And while that was going on, I made two other short visits to prime and paint the side panels.